When it comes to interviews, if you look at my track record, it’s pretty clear that I’ll talk to just about anyone from the game of football. And while I’m more than happy to talk to any player from the professional ranks about their experiences, I have a soft spot in particular for players who hail from the state of Ohio. After all, I’m from Ohio myself. And on top of that, a substantial number of my readers and followers call Ohio home, too. So helping to shed some more light on the lives of those who come from my own backyard seems as much a duty as it does a privilege. Luckily, Ohio has a pretty deep pool of players that populate MLS rosters. 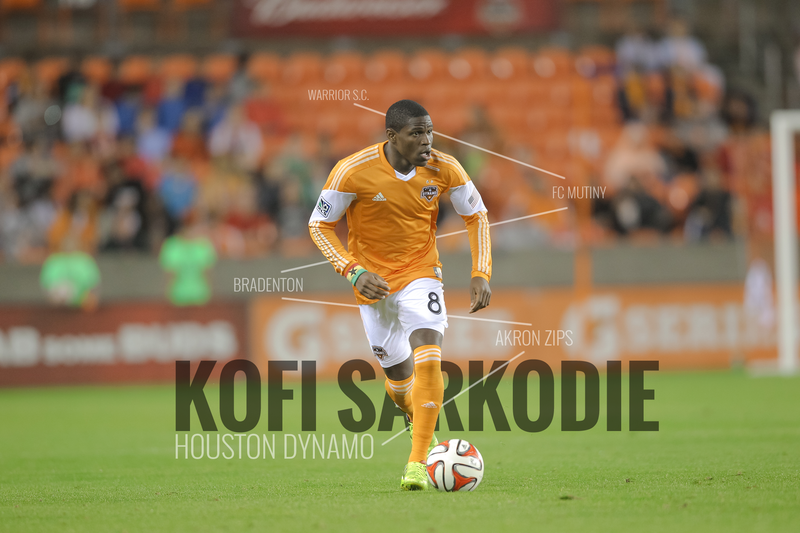 And one of the brightest among those that call the Buckeye state home is Houston Dynamo right back, Kofi Sarkodie. A product of Huber Heights — a suburb of Dayton — Kofi has represented the US at the youth level, won a national championship with the Akron Zips and established himself as one of the league’s best up and coming young defenders. So with the Dynamo off to a blazing start to the 2014 season, this seemed like the perfect time to talk with Kofi to talk about his younger days here in Ohio, the importance of his close relationships with his soccer-playing brothers, and his career to this point. DJ @ WSOTP: Tell us a little about growing up and playing soccer in Ohio: who did you play club, and what’s your favorite memory from your youth days? Kofi Sarkodie: Growing up in Ohio was actually neat — and something that not everyone knows — but there were a lot of Ohio-based players that are now playing in the league. And during my youth career, we actually played with each other and against each other. It’s really neat to see everyone grow from youth soccer all the way to professional and be from Ohio. I played for Warrior Soccer Club for some time and then I went and played at Ohio FC Mutiny in Columbus, with Tim Horton who was my coach there. That was kind of a major step that I took in my youth career and played a major role in my development. Chad Barson who plays for the Crew right now, [former Crew player] Aaron Horton, and Nick Kellogg who played basketball at Ohio University… we all played together at the youth level there. DJ @ WSOTP: You come from a family of soccer players: your brothers Kwame and Ofori both played in college and professionally. I’m sure you guys played together a bunch growing up. Between you and your siblings, who was the worst loser growing up? Kofi Sarkodie: I’m going to be honest with you: I was the worst loser for sure! But we are all really different in terms of how way we play. In my opinion, Kwame is the most naturally talented of us three. Ofori is kind of like a soccer guru — it’s like a chess match for him — and is very thought oriented when it comes to playing. I’ve kind of matched off both of them, but a lot more greedy than the both of them! And that’s where me being the worst loser comes from. DJ @ WSOTP: So this is kind of one of those small world moments, but I’m on the broadcast team for the NPSL’s Cincinnati Saints. And the Saints just so happen to be the team for which your older brother Kwame currently plays. So I reached out to him for a question of his own which was: Do you think you could defend Kwame in a 1v1 situation? Kofi Sarkodie: Okay, wow… that is the question! This is where the thinking part of my game that I picked from Ofori comes into play. For those who don’t know Kwame, he’s ridiculous: he’s probably the fastest of us three and also has a lot of skill. So I would really have to push Kwame into some help… I guess I’m cheating with this answer! I would try to never put myself in a position to have to defend him 1v1. I would do the work prior to that, you know? Kofi Sarkodie: I wouldn’t have to: I’d be right behind Kwame all game so he wouldn’t have space to turn! DJ @ WSOTP: So after your youth career, you left Carroll High School — a regional soccer power in Dayton that won a state championship in what would have been your sophomore year — early to study and train at the IMG Academy in Bradenton. Was it tough decision or a no-brainer? Kofi Sarkodie: For me it wasn’t really a tough decision. It helped that my brother Ofori paved the path before two years earlier by being invited to the same program. It was a great opportunity and a great experience to go down to Florida for two years to be playing with the best players in the US at the time. And I was fortunate enough to train at the great facilities and make it to the U-17 World Cup in South Korea. DJ @ WSOTP: It’s like you read my mind, as your time at the 2007 U-17 World Cup was the topic of my next question. You guys played a number of teams that now have players playing at the highest levels of the game — Toni Kroos for German, Eden Hazard and Christian Benteke for Belgium. Did anyone stand out at the time as being “exceptional”? Kofi Sarkodie: I played against Toni Kroos twice, and that was the first time I had played against Hazard. But even at that time, Kroos in particular was just on a different level mentally. He was a lot more mature, and you could see it in his game. He’s still young, and now that he’s got all of this experience, he’s only going to get better. But they (Kroos and Hazard) had those intangible attributes about them that really separated them even at the youth level. DJ @ WSOTP: How about the guys that you played with on US the team or otherwise, as truly being a cut above the rest? Aside from yourself, of course. Kofi Sarkodie: At the time, Jared Jeffrey was in really good form. He went on to play in Germany for some time, but is back now playing in DC. A good friend of mine, Brian Dominguez, who’s not in the states anymore, was also playing really well. DJ @ WSOTP: Let’s talk a little about your time as an Akron Zip. You helped the team to win a national championship in 2010 and also picked up a number of prestigious personal honors in the process. Are there any memories that really stand out? 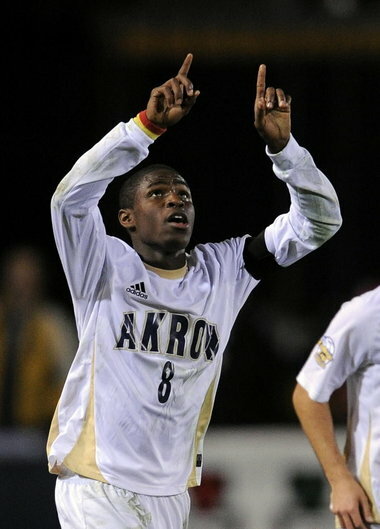 kofi was a collegiate standout for the akron zips, earning all-american honors and being named soccer america’s national player of the year. Kofi Sarkodie: There were two for me that were huge. Probably the most memorable time was the year — 2009 — that we went undefeated all season, but lost on PK’s in the final against [the University of Virginia]. I stepped up and was third to take the penalty. I hit it and I thought it was going in… but it hit the post and pops out. Our fifth penalty taker, who hadn’t missed all season, went to hit it… and it went over, and we were all kind of in awe. We had worked so hard and had put in so much. I can’t even really explain that emotion, the sadness. But it was a sadness that ended up driving us the next year. The next year there was another memorable time that really stood out. We were undefeated all year and we went to play Cleveland State, which was kind of like a big brother/little brother in-state rivalry. I was injured at the time so I didn’t get to play. But they were unranked, and we were the number one team in the country… and they beat us. We get back off the bus, go into the locker room and Caleb and all the other coaches left, and we talked for like 30 minutes — though I can’t disclose what was said, that’s our little secret! And after that, there was no turning back. Everything in our hearts, everything in our minds was put towards winning a championship. And that’s what we were able to do. DJ @ WSOTP: So after college you were drafted by the Houston Dynamo as the 7th overall pick in the 2011 draft. And between playing for Houston and playing at Akron, you’ve had the opportunity to play under two of the more heralded coaches in American soccer in Dominic Kinnear and Caleb Porter. How have things differed under the two coaches, and have their been any noteworthy similarities? Maybe in playing style or man management? Kofi Sarkodie: They’re very different. But the one thing that they have in common — and you can tell in their winning percentages — is they both like to win. In terms of their playing style is completely different. The same with training and player management. But that one similarity is, they know what to do within their respective ways to win. Dom’s an older guy, and Caleb is a little bit younger. I’m not sure how he is in Portland, but it’s a different time really. Because the reality is that me, Caleb, Darlington, all those guys… we grew up together. We went through each of those stages from being ranked in the Top 20, to being National Championship contenders, to being champions, to people considering us the best college team ever. And so it’s kind of hard to explain the subtle differences because of that. Now while I’ve been playing under Dom, it’s been a little bit more of a professional environment. From that standpoint, it’s making sure I’m coming to work and doing my job every single day. I need to make sure I understand what Dom wants from the team. It’s just a different air all together. DJ @ WSOTP: So what has been the biggest change now that you’re playing in that professional environment? Was there a certain element of you play that you’ve had to work on in particular? Kofi Sarkodie: I’m always looking to work on different things in my game. Every year I talk to my big brothers Kwame — even though he’s trying to start stuff in my interview! — and Ofori because they’re guys that I trust that have played at high levels of the game. And I ask them about what aspects of my game that I need to improve. Do I need to be able to shoot balls from 50 yards out? Because of the way my team’s style is, that’s the only options I’m going to have. So if that’s the way it is, if I want to be more dangerous for my team, then that’s what I need to work on. This year in particular, I’ve been working on making sure that my nine out of ten of my services are right on point. Every time I touch the ball, I want to get a quality service in. In terms of the transition from collegiate to professional, that’s a really interesting one. Sometimes it depends on where you are in the team, and where your new coach envisions you. If you come into a situation where your coach wants you to start right away, you have a little support and grow in that position. On the other hand, if your coach wants to look at you as a back up type of player and your used to starting and winning the national championship… you might not be used to being in that secondary type of role. It’s more of an adjustment mentally. Then you have to do what you can to continue moving forward, and get back to doing what you were doing collegiately in the professional ranks. DJ @ WSOTP: Speaking of the Dynamo, you guys are off to a flying start for the 2014 campaign. What do you think has helped you guys to get off to such a good start? Were preseason preparations different? New players making a difference? Kofi Sarkodie: There’s so many things. Right now we’re young, but experienced. We have guys that have been able to get some time and perform despite being young. This year it’s showing in the opening two games of the season that we can come up with a lot of fire, but still have enough grit to be sure we’re grinding out wins. The first game we jumped out to an early start with some good combination play. I had a good service from out wide — something I had mentioned I’ve been working on — Will took a deft touch and was able to bury in the back of the net. He’s in good form, the team is in good form, and we just need to keep grinding out these kind of wins. We’ve got a good opponent coming up this weekend when we go to Vancouver, so hopefully we can continue to play well. DJ @ WSOTP: One of the things I do on my site is conduct Fan Guides for MLS Stadiums, and last season I had the privilege of coming down to Houston to visit BBVA Compass Stadium. That place seems REALLY loud… is it the same way down on the pitch? Kofi Sarkodie: You know, it’s funny man, but when we start playing, I’m zoned out. Sometimes when someone does a move and beats a guy, I’ll hear the “Oooohhh” of the crowd. Or when we score a goal, I can really hear the stadium. But otherwise, I’m in my own little world. For when you click out of that zone for a little while, it is kind of amazing how loud it can be. For visiting teams, I’m sure the noise is a bit of a shock. Especially in the summer is so hot and it’s so loud, I’m sure the noise affects them just as much. DJ @ WSOTP: Aside from playing BBVA of course, is there anywhere you’ve played that really stands out in your memory? Kofi Sarkodie: It was cool playing in Portland. They’ve got a great atmosphere over there. There are lot guys that I grew up playing with at Akron there and it’s always neat to see and play against them. Overall though, everything was cool and it was a really really neat place to play. DJ @ WSOTP: What are your goals for the 2014 season, both as a team with the Dynamo, and personally? Kofi Sarkodie: That’s a great question, and one that I’m constantly looking at trying to make sure I’m putting in the work to get there. But as a team, the last two years, we’ve been right there. Two finals and the Eastern Conference final last year. We’re just so close. I’ve been there with Akron, I’ve been there with the youth national team, and I’ve been there with State Cup winning teams and such. So I know it’s just going to take a little bit more, that we need to keep pushing and putting in that work to be successful. We just need to keep working to get to pick up that cup at the end of the year; we can almost touch it. Personally for me, I’m just going to just keep working on my crossing and being effective in that area. And I want to make sure my numbers are reflective of that, so that at the end of the year I can sit back and say I produced this many assists and produced this many dangerous balls. So that way at the end of the season, I can see a direct indication of the hard work that I’ve been putting in after hours with my crossing and wide play. And one other thing I’m working on that a lot of people don’t know is that we — me and my brothers — put together our first youth soccer camp at Gateway in Dayton this past winter. We’re looking to put together another youth camp this summer. It will probably be co-ed, for kids ages 10-15 from the Dayton, Columbus and Cincinnati area to give back and spread some of the knowledge we’ve gained. It’s a chance for kids who want to get out and see what it’s like to train in a professional environment. Myself, my brothers, Chad Barson from the Crew will be involved, and we’re really excited to get the word out about that. DJ @ WSOTP: Well that’s everything I have for you Kofi. Thanks so much for taking some time to talk with me today, and best of luck with the rest of the season! Kofi Sarkodie: No problem, man. Thanks a lot for having me on. on time is Emotional Eating.